Just when you thought it couldn’t get worse or any dirtier, the 2016 race takes a giant leap into debauchery. Rich Lowry of the National Review showed just how much class he really has by going on Fox News, where Trump had been trashed all day, and proceeded to discuss how in reality, Fiorina, with surgical precision, removed his balls during the debate. If I didn’t think Fiorina was an establishment shill before, I do now. This is despicable behavior, but considering the way Fox News and the National Review have been conducting themselves during this race, it is hardly surprising. Their real face is showing and it isn’t pretty – yes, that was innuendo there. 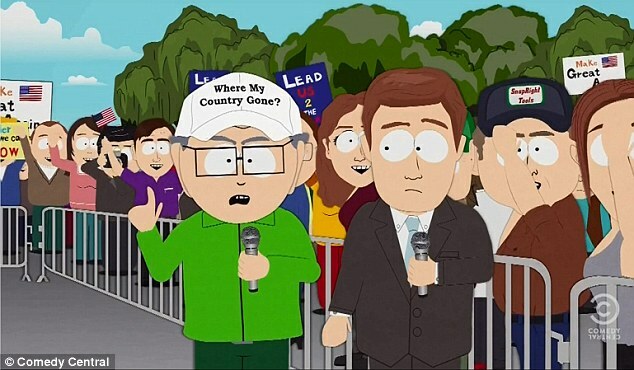 But if you thought Fox News was bad, they aren’t even in the same solar system as South Park who raped and murdered Trump in their latest episode over illegal immigration. Not kidding. 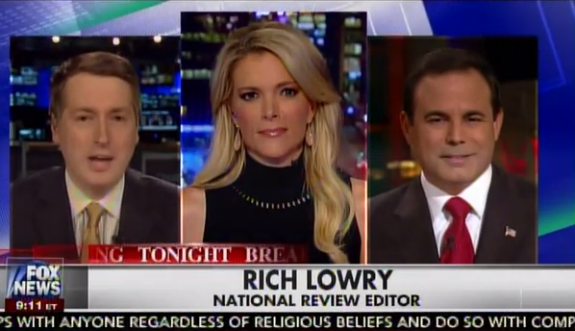 National Review editor and FOX News contributor, Rich Lowry attacked Donald Trump again tonight on The Kelly File. Lowry attacks Trump frequently on FOX News. Tonight, Lowry said Carly Fiorina cut off his balls with the precision of a surgeon. Look Trump attacks everyone but she’s become a much bigger target. And I think part of what’s going on here is that last debate. Let’s be honest, Carly cut his balls off with the precision of a surgeon. The show had featured Trump briefly once before, back in 2001, but had largely steered clear of mocking him – until now. Tycoon Trump’s campaign declined to comment on the episode, which was entitled ‘Where My Country Gone’. Fired from his job at the school for referring to Canadian children as ‘canucks’, he begins running for election under the slogan ‘Where my country gone’ which he has printed on to a hat in clear reference to Trump’s ‘Make American great again’ mantra. He then begins holding rallies, at which several people are carrying banners with Trump’s actual slogan on, proposing a radical policy on immigrants. ‘I propose we f*** them all to death,’ Mr Garrison tells a CNN journalist, as a shocking answer as how he would deal with the influx migrants. However, his mood turns sour after the journalist informs him that Canada has already built a wall across the border with America – a clear riposte to Trump’s supposedly simple plan to prevent illegal immigration into the US. 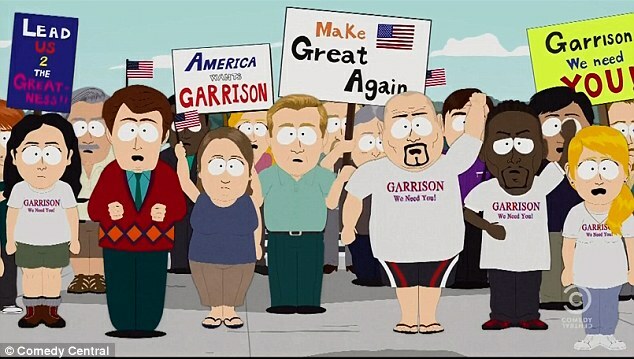 After a furious press conference along the U.S.-Canadian border, where Garrison shuts down his more mild-mannered opponents with his harsh and insulting rhetoric, he promises to go into Canada and ‘f*** them to death’ in their home country. As one Canadian explains in a clear dig at Trump’s rise to prominence in the polls this summer: ‘There were several candidates during the Canadian elections. One of them was this brash a****** who just spoke his mind. ‘He didn’t really offer any solutions, he just said outrageous things. We thought it was funny. Nobody really thought he’d ever be president. It was a joke! But we just let the joke go on for too long. ‘He kept gaining momentum, and by the time we were ready to say, “OK, let’s get serious now, who should really be president?” he was already being sworn into office. Back in South Park, news that the Canadian president has been ‘f***** to death’ causes jubilation, and the Canadians return home. However, in another controversial joke, she is shown running over a pedestrian – a reference to the real-life Caitlyn’s fatal car crash along a Los Angeles freeway earlier this year. When the Daily Mail says you have gone too far, you’ve stepped in it. South Park had their transgender, gay teacher proclaim that all illegal Canadians had to be deported and he wanted a wall. Lots of profanity was the norm as always, but a new twist was the final scene where Garrison rapes and murders Donald Trump. If I were Trump, I’d sue. That’s just going too far and is beyond the pale. It’s not funny… it’s incitement. You should see the murder threats on social media against Donald Trump. All because he is saying what the majority of Americans believe. We want the law and the Constitution followed and the borders secured. For that, Trump is slandered and killed in effigy. This hatred by the RINOs and the media (who I suspect are behind all of this) of Trump has gotten out of hand. Trump has the best security out there and that is a good thing. He had enough to worry about before the wealthy elite of the GOPe started hunting him. The game just got real. Don’t look for Trump to back off – he’ll double down and tell them to stuff it. But this does show America just what the Republican Party has become and it is grotesque.